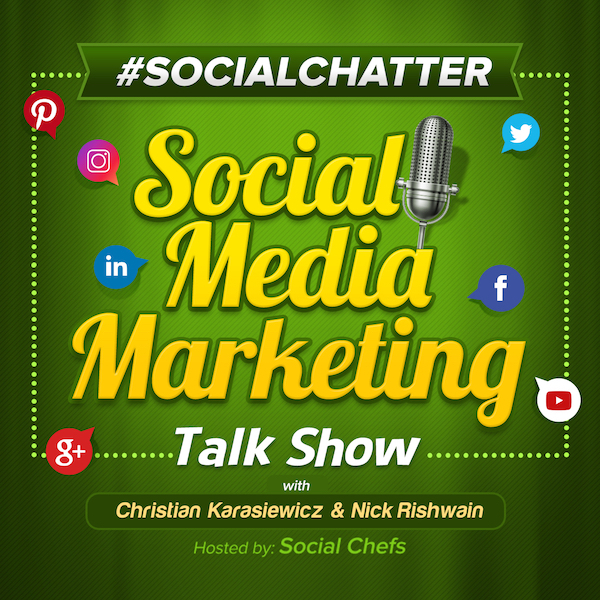 On this week's episode of Social Chatter, your weekly social media marketing talk show, we explore new ways to shop on Instagram, sharing links in Facebook Stories, YouTube vertical video ads and more with Christian Karasiewicz, Jessika Phillips and guest, Sheldon Payne. In Instagram news, you now have 2 new ways to shop on Instagram. These include the ability to shop Instagram Stories and to shop from the Instagram Explore tab. If you're a customer, you will now be able to shop on Instagram. First up, you can shop Instagram Stories. What this means is when you're watching someone's Stories, they can tag products. When you tap on these, you will be taken to a page to learn more about the item and then proceed to make a purchase. In addition to being able to shop on Instagram Stories, Instagram is launching a shopping channel in Explore. You can browse across your favorite interests. To see posts from the Explore tab on Instagram that offer shopping, look for the shopping bag icon. As a business, you'll want to first have create an Instagram business profile. Once your Instagram business profile is approved, you can add your produce on Facebook using Shopify or BigCommerce and then have Instagram review your account. You'll then have the ability to turn on shopping features on your Instagram business profile. To get started, the first thing you'll want to do is upgrade your Instagram app from your devices app store. To read more about how to shop on Instagram, click here. Also this week, Instagram began working on a host of additional features to include Instagram video tagging, emoji shortcuts and new Instagram superzoom effects. Let's take a look at these new Instagram features to see how they can impact your business. Instagram is testing a new feature called video tagging. This new feature, Instagram will recommend people to tag in your videos. While it's much easier to tag someone in a photo, video tagging can be more difficult. By adding a list of people to tag, Instagram is going to help you tag "people in this video." As a business, this can be a great way for you to identify customers who may not have tagged your company. This is currently still in testing and you'll only see it on mobile (for now - provided you have it). You can check by updating your Instagram app. To read more about video tagging on Instagram, click here. Instagram is also adding new emoji shortcuts as seen here. The new emoji shortcuts are available when you go to post a comment on Instagram. Now instead of switching to the emojis keyboard on your device, you can quickly access your favorite emojis to use in comments. One last feature that Instagram is adding are new superzoom effects. Inside Instagram Stories, you'll be able to access 6 new superzoom effects. These can be very useful for creating meme-worthy images to share on Instagram. To get the new effects, update your Instagram app from your devices App Store. As a business, you'll want to first create an Instagram business profile. In Twitter news, they are putting live video broadcasts at the top of your Twitter timeline. The next time you update your Twitter mobile app, you should see live broadcasts at the top of your Twitter timeline. Twitter will be showing you live video to include breaking news, personalities and sports at the top of your timeline. If you produce this type of content, expect to see greater exposure of this content on Twitter. One main reason Twitter is making this move is because most of the time, live video is what is happening in real-time. If you're interested in getting more people to notice you on Twitter, it's time to update your Twitter mobile app for iOS and Android and to being streaming more live video on your Twitter account. To read more about Twitter putting live broadcasts at the top of your timeline, click here. In Facebook news, they are testing the ability to share links in Facebook Stories. Users are making the move towards following your Facebook Stories as opposed to seeing your content in their News Feed. To prepare for this, it looks like Facebook is testing the ability to include links in Facebook Stories. Valentin Blanchot shared the following screenshot from her Facebook account. When you go to add content to your Facebook Stories, you can now include a link. As a business, this is great news, as Facebook Page's have the ability to share to Stories. This means that instead of telling someone to go check out your Page, you can provide a link that they can then click on. Overall, this is one more frictionless way for you to get your content in-front of your followers and over to your website. Right now they're currently testing this feature, but we expect it to be released in a future update to the Facebook mobile app. Stay tuned. To read more about adding links to Facebook Stories, click here. Also in Facebook news, they are working on improved controls to help advertisers control where their Facebook Ads appear for in-stream, instant articles and audience network ads. Facebook is giving you more control on where your Facebook Ads appear for in-stream, instant articles and audience network ads. You'll have the ability to put your ads into block lists - this way they won't appear in ad delivery. You'll also be able to exclude brand-sensitive content categories from ads across Facebook in-stream videos, Instant Articles and Audience Network. As a business owner, you want to ensure your ads are shown to the right targeted users. With these new improvements from Facebook, you'll have better control when running Facebook Ads to get your content out to the right people. To read more about Facebook instant experience ads, click here. In YouTube news, they are preparing to launch YouTube vertical video ads in an effort to keep Instagram's IGTV at bay. In an effort to compete with Instagram's IGTV, YouTube is preparing to launch vertical video ads. They're exactly what they sound like - instead of adapting vertical videos uploaded by users, YouTube will let brands run their own ads in this new format. What this means for you as a business owner is that you'll have a new type of video that you can create to get your message in-front of your audience. It also means that you may be able to run both desktop and mobile ads (since vertical video ads are primarily targeted at mobile users). These new YouTube ads "will be available to advertisers buying TrueView products (which brands only pay for it users opt-in to view their ads) and Universal app campaigns." In addition to vertical video ads, YouTube is also going to start to let brands buy inventory in individuals' Home feeds. This way they'll be able to serve content that is tailored to personalized recommendations for a user. You can read more about YouTube vertical video ads here. The first tool that we have discovered this week is Clean Text (iOS). Clean Text is an indispensable tool for anyone who writes blog posts, proposals, manages websites or posts social media updates. With Clean Text, instead of manually going through your text to remove extra spaces, convert quotation marks, or track down that unwanted HTML code, you can quickly run your text through Clean Text and it will help beautify it. Now when you go to publish your blog post, proposal or social media updates, any unnecessary text will be fixed and your content will look how it needs to be. Overall, Clean Text can save you a lot of time and help you focus more on running your business instead of fixing text formatting issues. Clean Text is available for $3.99. The second tool that we have for you this week is Enlight Pixaloop (iOS). Pixaloop is a mobile app to help you animate your photos and bring them to life. For example, you an isolate elements in a photo and add movement to just those parts. According to Pixaloop, here is how easy it is to animate a photo. "To animate a photo, place arrows to define motion within the image. Add anchors to gradually reduce the speed in the animated area. Freeze motion in parts of your photos to hold specific elements still and keep it real. Or get unreal and tease nature – reverse the direction of water or spills to defy gravity and flow upwards!" Take a look at this short video showing you all of the great things that you can create using Enlight's Pixaloop. You can download Pixaloop for free from the following link. Thanks again Social Chefs Christian Karasiewicz, and Jessika Phillips for having me on #socialchatter last night. I look forward to speaking with you again in the future. Thanks again for being a guest on #SocialChatter, @sheldonpayne:disqus. I’m really glad you were able to make it and look forward to working more with you on future projects!